Although Boston has a few excellent Middle Eastern restaurants, it seems that this type of cuisine is just a bit underrepresented in and around the city. In fact, it might just be better to head west to Worcester, which has nearly as many good Middle Eastern dining spots as Boston even though it is a fraction of the size of Beantown. And if it is both atmosphere and food you want, Worcester may just have the perfect spot for you, as the Sahara Cafe and Restaurant succeeds quite nicely on both counts. Located just north of downtown Worcester in a quirky neighborhood that is a popular hangout for college students, the Sahara is just one of several interesting dining spots on this little stretch of Highland Street (which is actually Route 9). The interior of the Sahara is almost elegant, with a large, open area in the front, a huge chandelier hanging from the ceiling, an attractive bar and lounge section toward the back, and a number of tables off to the side, some of which have window seats for people-watching. The menu at the Sahara features all kinds of soups, salads, appetizers, sandwiches, and main entrees, with an emphasis on Lebanese dishes. For soups, it is tough to beat the comforting taste of the spinach and lentil bean soup, and the salads are fresh and tasty. Those who are looking for sandwiches can choose from several types of kebabs, as well as kibbi and tabbouleh. For appetizers, the falafel is exquisite, though be aware that it is not the "green" falafel that is favored by many diners. Other apps include meaty stuffed cabbage leaves with a delightful combination of mint and lemon juice, a smooth and rich hummus (there is also a hot hummus dish that includes seasoned beef), a similarly rich and filling baba ghannoj, and vegetarian stuffed grape leaves that have a nice taste of mint and spices. Many main entrees can also be found on the menu at the Sahara, but it would certainly be difficult to find anything better than their extraordinary chicken shawarma. The thinly-sliced chicken (with no gristle at all) is marinated in a flavorful sauce with hints of nutmeg, giving this dish an exotic taste that you won't forget for a long time. If you can get past ordering the chicken shawarma here, there are plenty of other interesting entrees, such as a falafel sandwich with the crunchy/zesty goodness of pickled turnips mixed in, a baked fish fillet in tahini sauce, and a sliced eggplant stuffed with ground beef, pine nuts, and onions. And for those looking for a little bit of everything, the vegetarian plate provides a nice variety of items. 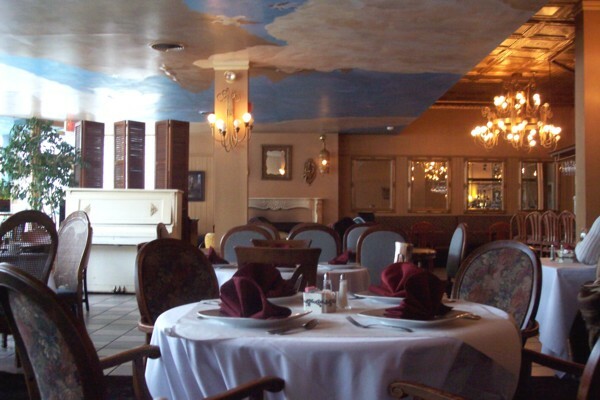 The Sahara Cafe and Restaurant brings to mind an old favorite in Lawrence called Bishop's, a beloved Middle Eastern restaurant with loads of atmosphere that is unfortunately long gone now. For those who miss Bishop's (or simply would like to dine on good Middle Eastern food in a nice environment), the Sahara is certainly a place to seek out, even for those who live 45 minutes east in the city of Boston. Copyright © 2008-2012, Boston's Hidden Restaurants (www.hiddenboston.com).